Stevie Franklin is using her vacation time from her job at the U. S. Botanic Garden in Washington, D. C., to visit Blue Hollow Falls, Virginia, to help Sunny Goodwin, her best friend and former colleague, start her new business in the historic greenhouse she inherited (Blue Hollow Falls). But when frozen pipes at Sawyer’s home lead Sawyer and Sunny to seek refuge with Addie Pearl, Stevie ends up at the local inn, owned and operated by Noah Tyler, who is the embodiment of Sunny’s promise that hot lumberjack-types can be found in Blue Hollow Falls. Noah, a native of Ohio, moved to Virginia to attend William and Mary and became so captivated by the region that he never left. When he found the old mill at Blue Hollow Falls and began renovating it, he knew he had found his place. Two and a half years out of a long-term relationship that ended without drama, he is ready to find someone special. Stevie may be just the person for whom he is looking. He just needs to convince her of that. There are other things I loved about the story, including, but not limited to, the snow storm (which makes for a nice twist on a “cabin romance”), the setting (always a strong point with Kauffman), and glimpses of Sunny and Sawyer’s HEA in progress. If you are looking for adventure, action, and angst, this novella is not for you. But if you like character-driven tales with humor, heart, and a bit of heat, I predict you will enjoy this holiday novella. It has given me one more reason to expect the Blue Hollow Falls series to become a favorite. I have already starred the release date of Bluestone & Vine (June 26, 2018) on my book calendar and am eagerly anticipating Seth’s story. I love Donna Kauffman's books. I have not read this yet but it is on my list to read. 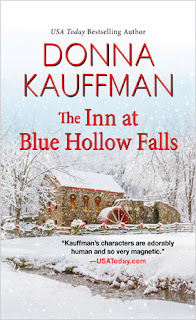 I too love Donna Kauffman's book and especially this latest series - Blue Hollow Falls. Her descriptions of the area is vivid & amazing, making me easily picture it in my head.